The 14-22 Los Angeles Lakers take on Blake Griffin and the 25-13 LA Clippers at the LA Staples Center tonight at 7:30pm. The Clippers, have home court tonight and are coming off back-to-back wins without Chris Paul. Tickets for tonight’s Lakers Vs Clippers game are still available! Your chance to win tickets to an upcoming game? Congrats to Vanessa Gutierrez she won a free pair of Clippers Tickets! Which Team Would You Want to See? To Enter: (Hashtag) #barrystickets as well as the team you would want to see either #clipperstickets or #lakerstickets via your Facebook, Twitter, Instagram, G+ account or below and you could win tickets to see either the Lakers or Clippers play at the Staples Center! No purchase necessary! Winner will be able to select a game from various dates available. Tickets must be picked up the night of the game from our downtown office by the winner and winner must show legal identification. If a winner is not able or chooses not to accept prize “as is”, winner forfeits his/her prize, and Barry’s Ticket Service reserves the right to select another winner. Barry’s Tickets reserves the right to change a promotion at anytime. No purchase necessary Barry’s Tickets Service is an Official Partner of the Los Angeles Clippers. Only One Barrys Bucks/Discount Code/Promotional Code may be used per transaction.By:Chris Michaels. Barry’s Ticket Service has been buying and selling Lakers Tickets and Clippers Tickets since 1985 and is located caddy-corner from the Staples Center. All Tickets come with a 100% guarantee that they are Authentic and will be delivered on time! Published by Barry’s Ticket Service. Barry’s Tickets is not affiliated with the NBA or Los Angeles Lakers. Tonight the Clippers look to even the score in this seasons Battle For Los Angeles Series after losing the season opener 116-103 to the Lakers. Both Chris Paul and Kobe Bryant will be watching from the bench as Blake Griffin and Pau Gasol both look to make statements. 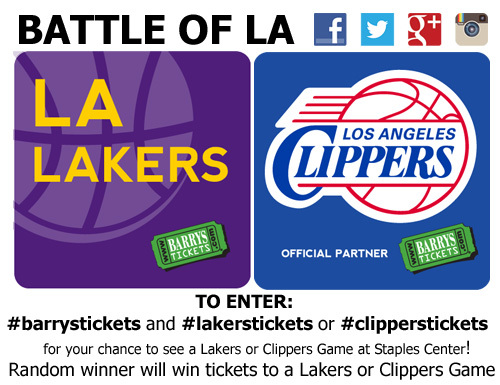 Battle Of LA Tickets are still available for tonight’s Lakers/Clippers Game! SORRY THERE WERE NO WINNERS FOR THIS CONTEST! SOME CLOSE SCORES BUT NO WINNERS! Barry’s Contest for Tonight’s Battle Of LA! 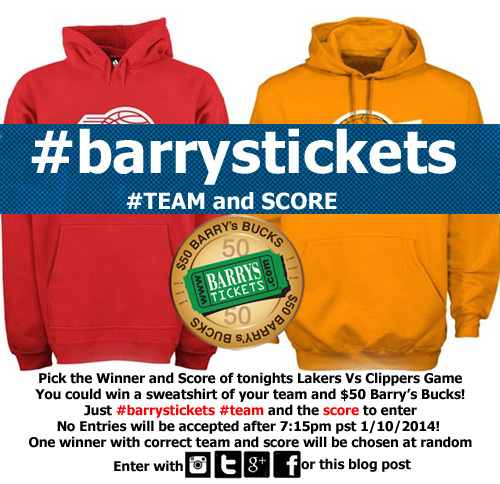 To Enter: (Hashtag) #barrystickets as well as (Hashtag) the winning team either #clippers or #lakers and the SCORE on either your Facebook, Twitter, Instagram, G+ account or below and you could win your teams sweatshirt as well as $50.00 Barry’s Bucks good on www.BARRYSTICKETS.com! ALL THREE MUST BE INCLUDED IN ORDER TO WIN! ONE WINNER WILL BE CHOSEN! No purchase necessary! Who Will Win Clippers or Lakers?